version for industrial door applications with heavy duty motors and lath sections in 3 different fixing versions. This is a classic single skin steel roller shutter. The scrolled slat profile is a familiar sight in most applications on many commercial parks, industrial estates and high streets in different colours and sizes, now updated with a quality powder coated finish. Manufactured with aluminium head box and guides for higher grade applications and easier installation, also available with traditional galvanised steel channels and head box. A variant on the traditional 75 shutter - the same robust performance but with the addition of vision by perforating small holes into the slats. 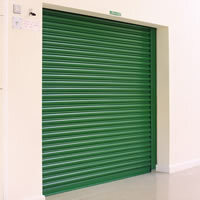 This shutter is ideal as a door and window security shutter where vision may be required at night for continued display of goods or increasing light around the building for security.